Meatballs with Creamy Tomato Sauce for an easy weeknight dinner that’s ready in minutes! 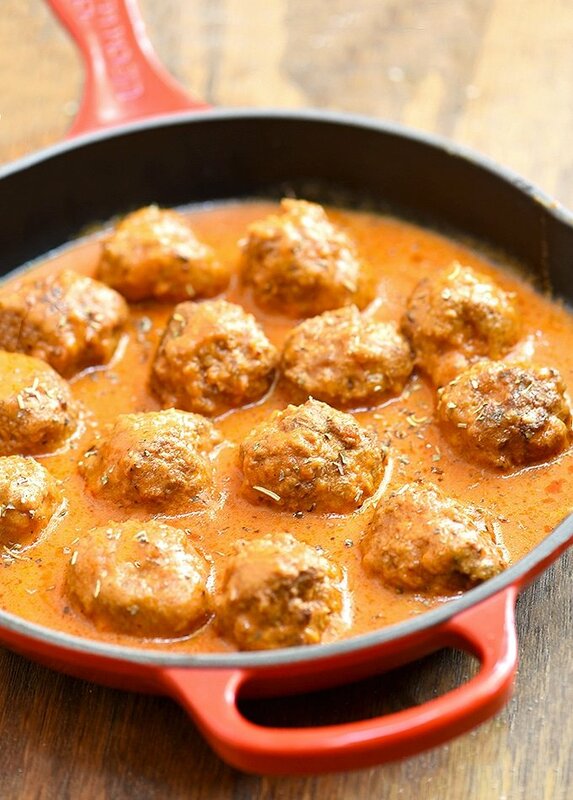 With juicy, flavorful meatballs in a creamy tomato sauce, they’re amazing with steamed rice, mashed potatoes or noodles! Meatballs with Creamy Tomato Sauce are a mash-up of our two favorite meals at home. We love tender, juicy Swedish meatballs and the creamy blush sauce we use with Angel Hair pasta so combining the two into one delectable dish was the perfect next step. If you’re looking for a weeknight dinner that’s easy to prep yet full on flavor, this beef meatballs in tomato sauce recipe is a keeper. 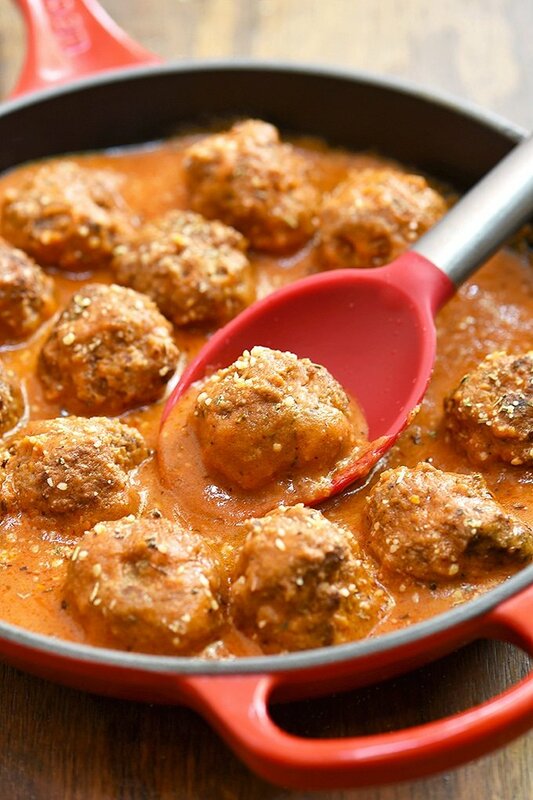 With moist and flavorful meatballs swimming in a creamy and tangy gravy, it’s a guaranteed family pleaser! Not only are they a sure crowd favorite, these meatballs are versatile, too. There are so many delicious ways to enjoy them! They make a fantastic appetizer for a party, are amazing between toasted french roll as a sandwich, and delicious served over steamed rice, mashed potatoes or noodles. These meatballs are a mix of equal parts ground beef and ground pork for extra juicy texture. Use fresh bread soaked in milk or broth instead of dry breadcrumbs as a binder. This soaked bread paste or panade adds moisture for more tender meatballs. Grate the onions instead of chopping. This makes the meatballs juicier, more flavorful and with no chunks of onions to bite into. Use a scoop to easily and evenly portion out the meat and then roll into round shapes between the palm of hands. If the meat is sticking, rinse hands with cold water between shaping. I also find chilling the mixture beforehand makes it easier to roll into meatballs. 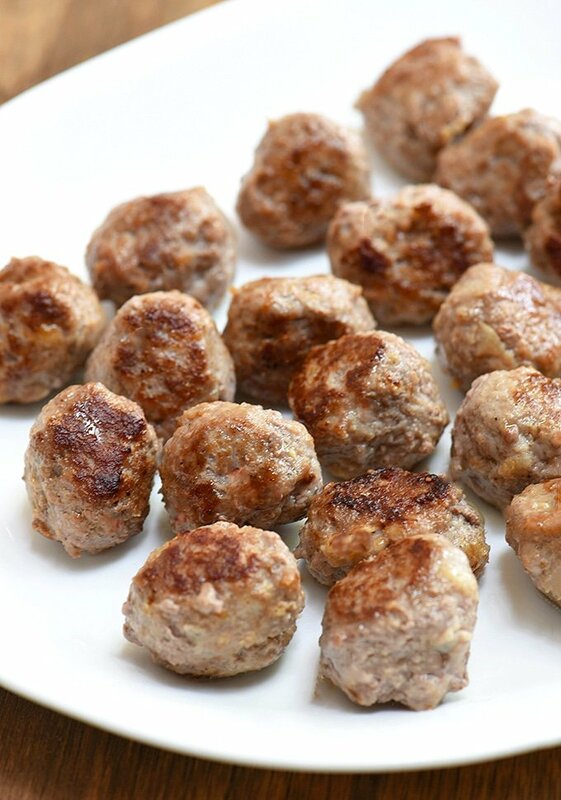 Chill the meatballs just until firm to help them keep shape during frying. I pan-fried the meatballs in the pan but you can always bake them in the oven to brown and just finish them off in the sauce. Arrange the meatballs in a single layer on a lightly greased baking sheet. With a spatula, carefully remove meatballs from the pan and use in the recipe. Whether pan-frying or baking, don’t cook the meatballs all the way through as they will simmer in the sauce. Give these homemade meatballs a try for dinner tonight and let me know what you think in the comments below. I love hearing from you. Meatballs with Creamy Tomato Sauce for an easy weeknight dinner that's ready in minutes! 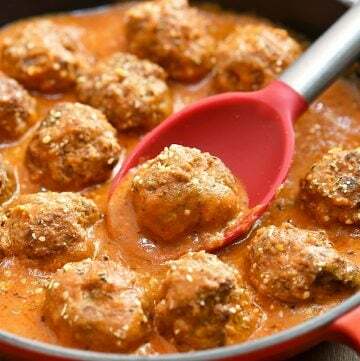 With juicy, flavorful meatballs in a creamy tomato sauce, they're amazing with steamed rice, mashed potatoes or noodles! In a large bowl, combine ground beef, ground pork, soaked bread, onions, eggs, salt and Italian seasoning. Gently mix until combined. In a skillet over medium heat, heat oil. Add meatballs in a single layer and cook, gently turning on sides as needed, until lightly browned but not cooked through. Remove from pan and drain on paper towels. Keep warm. Alternatively, arrange meatballs in a single layer on a baking sheet and bake in a 400 F oven for about 10 to 15 minutes or until no longer pink. In another pan over medium heat, heat the remaining 1 tablespoon oil. Add tomato sauce, heavy cream, and water. Season with salt and pepper to taste. Stir to combine and bring to a simmer. 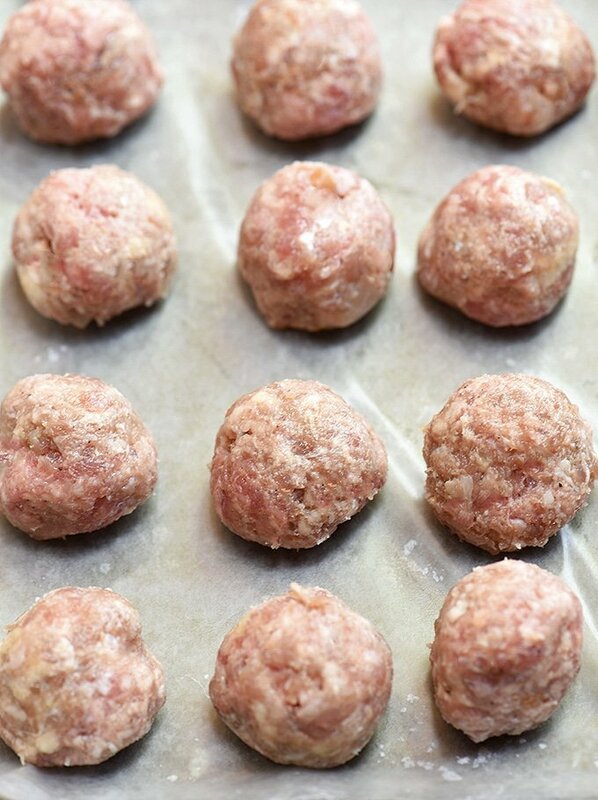 Add meatballs in a single layer and cook, stirring occasionally, for about 8 to 10 minutes or until meatballs are until thermometer inserted in the center of meatball reads 145 F.
Sprinkle with Parmesan cheese, if desired. Serve hot.